Showy leaves are light green with creamy-white edges. 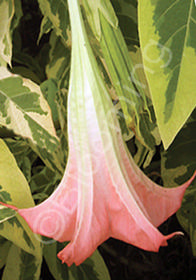 Large creamy-pink, trumpet flowers hang from branches mid-to-late summer. From Keith Miner.